For other uses, see Ivory Tower (disambiguation). 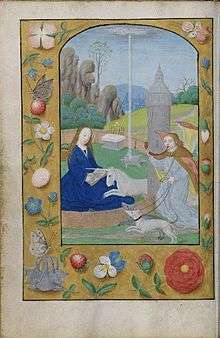 An ivory tower, as symbol of Mary, in a "Hunt of the Unicorn Annunciation" (ca. 1500) from a Netherlandish book of hours. For the complicated iconography, see Hortus Conclusus. The term ivory tower originates in the Biblical Song of Solomon (7:4) and was later used as an epithet for Mary. From the 19th century, it has been used to designate an environment of intellectual pursuit disconnected from the practical concerns of everyday life. In American English usage it is also used as shorthand for academia or the university. 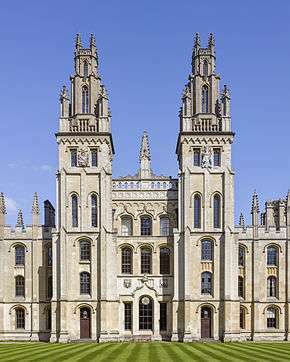 In the Judeo/Christian tradition, the term ivory tower is used as a symbol for noble purity. 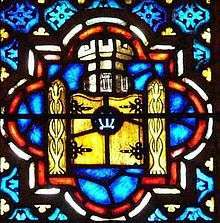 It originates with the Song of Solomon (7:4) ("Your neck is like an ivory tower"; in the Hebrew Masoretic text, it is found in 7:5) and was included in the epithets for Mary in the sixteenth century Litany of the Blessed Virgin Mary ("tower of ivory", turris eburnea in Latin), though the title and image was in use long before that, since the 12th century Marian revival at least. It occasionally appears in art, especially in depictions of Mary in the hortus conclusus. Although the term is rarely used in the religious sense in modern times, it is credited with inspiring the modern meaning. Henry James' last novel, The Ivory Tower, was begun in 1914 and left unfinished at his death two years later. Paralleling James' own dismaying experience of the United States after twenty years away, it chronicles the effect on a high-minded returning upper-class American of the vulgar emptiness of the Gilded Age. "You seem all here so hideously rich," says his hero. Thus, there are two meanings mixed together: mockery of an absent-minded savant and admiration of someone who is able to devote his or her entire efforts to a noble cause (hence "ivory", a noble but impractical building material). The term has a rather negative flavor today, the implication being that specialists who are so deeply drawn into their fields of study often can't find a lingua franca with laymen outside their "ivory towers". Moreover, this problem is often ignored and instead of actively searching for a solution, some scientists simply accept that even educated people can't understand them and live in intellectual isolation. 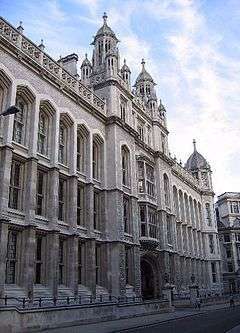 In Andrew Hodges' biography of Alan Turing, while discussing Turing's 1936-38 stay at Princeton University, he writes that "[t]he tower of the Graduate College was an exact replica of Magdalen College Oxford, and it was popularly called the Ivory Tower, because of that benefactor of Princeton, the Procter who manufactured Ivory soap." William Cooper Procter (Princeton class of 1883) was a significant supporter of the construction of the Graduate College, and the main dining hall bears the Procter name. In Randall Jarrell's essay 'The End of the Line' (1942), Jarrell asserts that if modern poetry is to survive then poets must come down from the "Ivory Tower" of elitist composition. Jarrell's main thrust is that the rich poetry of the modernist period was over-dependent upon reference to other literary works. For Jarrell the Ivory Tower led modern poetry into obscurity. The Elverson Building, former headquarters of the Philadelphia Inquirer was known as the "Ivory Tower of Truth." An ivory tower may also be an entity of "reason, rationality and rigid structures [that] colonizes the world of lived experience," as explained by Kirsten J. Broadfoot in an article about the possibilities of postcolonial organizational communication. This imagined academic community creates an essence of exclusivity and superiority. Broadfoot explains this as a group that "functions like an exclusive club whose membership is tightly controlled by what might be called a 'dominant frame.'" In an academic sense, this leads to an "overwhelming and disproportionate dominance" of the United States and the Western world. The ivory tower can be dangerous in its inherent privatization of knowledge and intellect. Academics who are seeking "legitimacy for their narratives from the heart end up echoing the sanitized tone of the Master Narrative." This becomes a cyclical process as intellects collectively defend the "imaginary ivory tower." 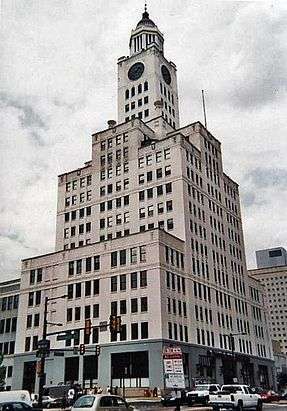 Writers for Philadelphia's other newspapers sarcastically referred to the former headquarters of the establishment Philadelphia Inquirer, a white art deco tower called the Elverson Building, as the "Ivory Tower of Truth." ↑ "Song of Songs 7:4". The Bible. ↑ Bull, Marcus Graham (1999). The Miracles of Our Lady of Rocamadour: Analysis and Translation. Woodbridge: Boydell & Brewer. p. 29. ISBN 0-85115-765-3. 1 2 Quinion, Michael (2001-01-13). "On "Ivory Tower"". WorldWideWords.org. Retrieved 2007-04-24. The origin is the Bible, specifically Chapter 7, Verse 4 of the Song of Solomon, in which Solomon is extolling the beauty of his beloved... Not quite the thing today [...] but it struck a chord with Charles-Augustin Saint-Beuve. ↑ Hodges, Andrew (1983). Alan Turing: the enigma. New York: Simon & Schuster. ISBN 0-671-49207-1. OCLC 10020685. ↑ Jarrell, Randall (2008). 'The End of the Line' In Cook, J. ‘Poetry in Theory: An Anthology 1900-2000’. Oxford: Blackwell. ISBN 978-0-631-22554-6. ↑ "Management Communication Quarterly". sagepub.com.